The National War Memorial will be the site of the largest commemoration of Remembrance Day in the nation's capital, but it's far from the only one. View a map of the many Ottawa legion parade starting points here. 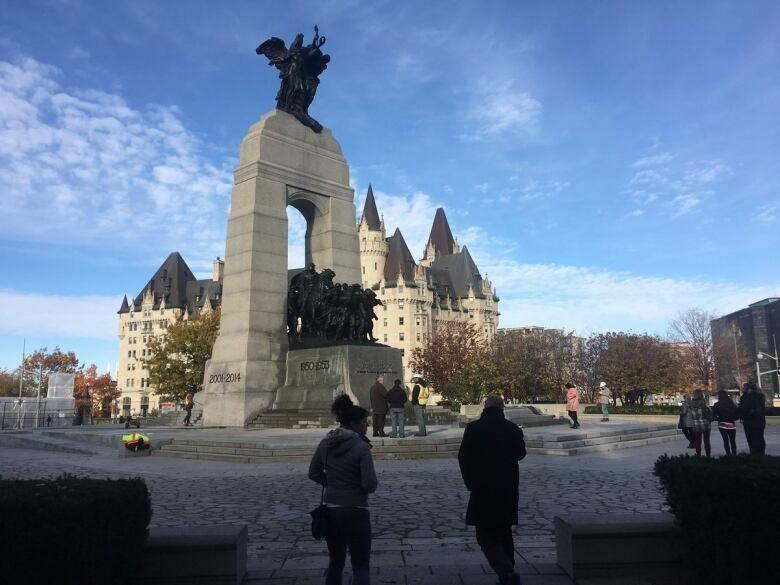 The National War Memorial will be the site of the largest commemoration of Remembrance Day in the nation's capital, but it is far from the only one. Here's a look at each of those ceremonies, and when they're expected to get underway. The commemoration at the National War Memorial begins at 10:20 a.m. when contingents arrive. The playing of O Canada and The Last Post begins at 10:57 a.m. ET. Rideau/Wellington Street between Nicholas Street and Bank Street. Queen Street between Metcalfe Street and Elgin Street. Elgin Street between Wellington Street and Slater Street. MacKenzie Avenue between Murray Street and Rideau Street. Metcalfe Street between Wellington Street and Albert Street. O'Connor Street between Wellington Street and Queen Street. Other parades and ceremonies in the city. 10:30 to 11:30 a.m. Royal Canadian Legion (Bells Corners Branch 593) marching from Centrepointe Drive between Constellation Crescent (south intersection) and Chrysalis Way. (formerly Epsilon Way). 1:30 to 3 p.m. Royal Canadian Legion (Eastview Branch 462) parade begins north on Cyr Avenue between the Royal Canadian Legion and Montreal Road, then east on Montreal Road to Hannah Street, and north on Hannah to Marier Avenue, then to the Vanier Cenotaph for the ceremonial service. 10:15 a.m. to 12:15 p.m. Royal Canadian Legion (Kanata Branch 638) parade begins east on The Parkway between Earl of March High School and Teron Road, then south on Teron Road to Colchester Square, and then west on Campeau Drive to the John Mlacak Centre. 10:30 a.m. to noon. Royal Canadian Legion (South Carleton Branch 314) parade begins east on Beaverwood Road from the Royal Canadian Legion to Manotick Main Street; then north on Manotick Main Street to Clapp Lane, then east on Clapp Lane to the Manotick Cenotaph for the ceremonial service. Then, after the service, the route will continue south on Dickinson Street to Mill Street, west on Mill Street to Manotick Main Street, south on Manotick Main Street to Beaverwood Road, and west on Beaverwood Road to the Royal Canadian Legion (Branch 314). 10:30 a.m. to noon. Parade begins at Colonial Road between Henn Drive and Delson Drive and continues to the Navan Cenotaph for the ceremonial service. 10:30 to 11 a.m. Royal Canadian Legion (Branch 632) parade begins at Taylor Creek Boulevard between Vimont Court and the Royal Canadian Legion and continues to the Orleans Cenotaph for the ceremonial service. 10:45 a.m. to noon. Royal Canadian Legion (Osgoode Branch 589) parade begins on Victoria Street between Eighth Line Road and Louise Street and continues to the ceremonial service at the Osgoode Cenotaph in front of the Municipal Building. 10:45 a.m to noon. Royal Canadian Legion (Richmond Branch 625) service at Perth Street between the Richmond Shopping Plaza and the Richmond Memorial Park. 1:45 to 2:45 p.m. Royal Canadian Legion (Stittsville and District Branch 618) parade begins north on Stittsville Main Street between the Royal Canadian Legion and Warner-Colpitts Lane, then west on Warner-Colpitts Lane to the Stittsville Cenotaph for the ceremonial service. 1:30 to 3 p.m. Royal Canadian Legion (Westboro Branch 480 parade begins north on Winston Avenue at the legion to Madison Avenue, then east on Madison to Churchill Avenue, then south on Churchill to Richmond Road, and then west on Richmond to Broadview Avenue and the Westboro Cenotaph. Wreath laying and ceremonial service at Westboro Cenotaph from 2:30 p.m.